(n) HUD (humanitarian use device) means a medical device intended to benefit patients in the treatment or diagnosis of a disease or condition that affects or is manifested in fewer than 4,000 individuals in the United States per year. (m) HDE means a premarket approval application submitted pursuant to this subpart seeking a humanitarian device exemption from the effectiveness requirements of sections 514 and 515 of the act as authorized by section 520(m)(2) of the act. A Humanitarian Device Exemption (HDE) application is similar to a premarket approval (PMA) application. However, due to the limited size of the target population and the impracticability of conducting clincal trials to establish safety and effectiveness, an HDE is exempt from the requirement to establish reasonable assurance of effectiveness. The FDA's approval is based its determination that the device will not expose patients to an unreasonable risk of injury or illness and the "probable benefit" to health. This is a considerably lower standard than proof of safety and effectiveness. FDA approval of an HDE authorizes an applicant to market the HUD, subject to certain profit and use restrictions. HUDs cannot be sold for profit, except in very limited circumstances. Most importantly, they can only be used in a facility after an IRB has approved their use in that facility, except in certain emergencies. How is an HDE different from an IDE? An IDE is an exemption that allows a sponsor to ship an investigational device prior to marketing approval; it authorizes the investigational use of the device. A HUD with an approved HDE is approved for marketing. This means that the sponsor can ship the device and can bill for its use (but cannot make a profit from its sale except under limited circumstances). To receive approval for an HDE, the FDA must conclude that there is no comparable device available to treat the disease or condition. If a comparable device is approved by the FDA, the HDE approval may be withdrawn. An HDE therefore is analogous to a PMA application; its an application to market the device. An IDE is an application to ship an investigational device to conduct studies. To approve a PMA device, the sponsor has to provide data from adequate and well-controlled trials that provide substantial evidence of effectiveness (and safety). The requirements for approval of an HDE application to market a HUD are quite a bit lower. FDA's Q&A states that an approved HDE represents "a determination by FDA that the HUD will not expose patients to an unreasonable or significant risk of illness or injury and the probable benefit to health from use of the device outweighs the risk of injury or illness from its use while taking into account the probable risks and benefits of currently available devices or alternative forms of treatment." 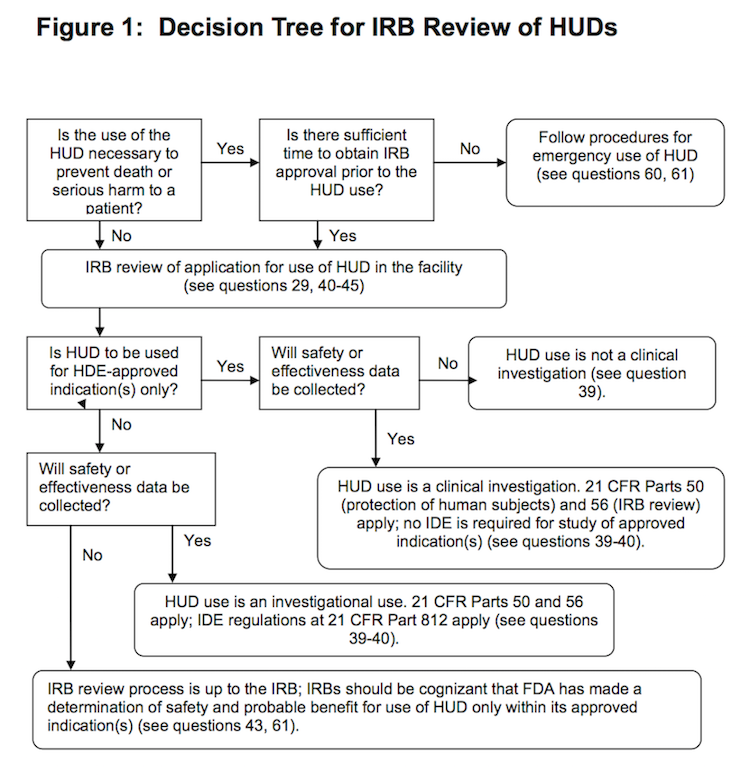 What are the IRB's Responsibilities for a HUD? After HDE approval, a HUD may only be used after IRB approval has been obtained for the use of the device, even for the FDA-approved indication, except for an emergency use situation. The IRB is required to perform its initial review at a convened meeting using the criteria for approval at 21 CFR 56.111. Subsequent continuing reviews - at least annually - may be performed using expedited procedures. Expedited review is permitted because a HUD is an approved device. For groups of HUD patients that meet certain criteria;. From the March 18, 2014 FDA Draft Guidance: Humanitarian Device Exemption (HDE): Questions and Answers. 21 CFR 814. See Subpart H - Humanitarian Use Devices, which contain the regulations governing HUDs. FDA Guidance Document Humanitarian Use Device (HUD) Designations issued January 24, 2013. Institutional Review Boards and Humanitarian Use Device (HUD) Powerpoint learning module presented by Dr. Fabienne Santel of the Center for Devices and Radiological Health at the FDA.